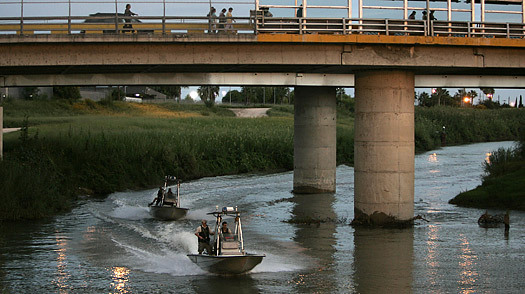 The ebbing stretch of Rio Grande that divides the Texas city of El Paso from the Mexican city of Juarez may soon become one of the world’s most militarized borders. This week, as Texas Governor Rick Perry went to El Paso to announce that has asked Washington for 1,000 more “boots on the ground” to enforce the border, Mexico’s government ordered 5,000 extra soldiers to Juarez. The armies massing on both sides of the border are marching against a common foe  drug cartels  and the coming months will be a crucial test as to whether they can effectively work together to fight it. The Rio Grande “surge” comes amid a growing wave of drug-related bloodshed across Mexico that has visited some of its worst violence on Juarez. The sprawling industrial border city of 1.6 million became Mexico’s murder capital in 2008, with more than 1,600 drug related killings, and this year’s toll looks set to be even higher, with 250 killings in February alone. Mexican authorities were particularly shaken by a Sunday ambush against local state governor Jose Reyes Baeza’s three-car convoy that killed one of his bodyguards. On Wednesday, President Felipe Calderon flew to Juarez for an emergency security meeting, which was plagued by three bomb scares. The following day, the army announced it would send 5,000 troops to back up the 2,000 soldiers already patrolling the streets of Juarez to fight the gangsters. A Baghdad-style surge, the Mexican government hopes, will quell the slaughter. North of the river, Perry gave a news conference about his troop request on Tuesday while flanked by gun-wielding officers at El Paso’s Chamizal National Memorial  a park that celebrates the buoyant border culture and flies U.S. and Mexican flags side by side. “I don’t care if they are military, National Guard or customs agents,” he said. “We’re very concerned that the Federal government is not funding border security adequately. We must be ready for any contingency.” Perry was not clear, however, as to exactly what the troops would do to fight the drug gangs. The violence on the Mexican side is not confined to Juarez, but has also exploded down the river in Reynosa, where earlier this month a series of simultaneous firefights locked the city down for four hours. Last week, Texas Homeland Security Director Steve McCraw named Mexican gangs as “the most significant threat Texas faces,” while asking the state legislature for $135 million to boost his department. But Texas border towns have proven remarkably immune to the bloodshed across the river  El Paso had one of the lowest murder rates among U.S. cities, although many have lost loved ones across the river. Violence exported from Mexico has risen sharply, instead, in key trafficking points in the U.S. interior, such as Phoenix, Arizona, and Atlanta, Georgia. Mexico’s immediate reaction to Perry’s call for reinforcements was largely ignored by Calderon and his top security officials this week. However, they did applaud the U.S. Drug Enforcement Agency for its “Operation Xcellerator,” a sting that has netted 755 suspected Mexican cartel members and seized 23 tons of drugs over several months. Rep. Roberto Badillo, secretary of the National Defense Committee in the Mexican Congress, said he had no opposition to the U.S. bolstering its southern border. “They have every right to move troops around and do whatever they feel necessary to defend their nation and its sovereignty,” he told TIME. But he made a point of warning that the U.S. forces should stay firmly on their side of the river. “I would never, ever, support the intervention of foreign troops in our territory, and that is the way that 99.9% of Mexicans think,” he said. The specter of U.S. troops fighting the cartel armies on Mexican soil is not simply a product of paranoia, however. The possibility was raised in a Pentagon policy document last December. The report by U.S. Joint Forces Command, entitled “Joint Operating Environment 2008”, focuses on the challenges potentially facing the U.S. military over the next 25 years. It speculates that the Mexican state could face “a rapid and sudden collapse” from the onslaught of cartel paramilitary armies, and says the U.S. forces would have to respond to such a threat. “Any descent by Mexico into chaos would demand an American response based on the serious implications for homeland security alone,” it says.